This NHL art canvas comes personally autographed by both NHL superstars Sidney Crosby and John Tavares. The officially licensed image has been printed on to high quality art canvas and is professionally stretched and mounted on the back of a 3/4" deep wooden frame. The mounted canvas is placed into a 1.5" thick black float frame for a high quality finishing display. This frame highlights the game on October 18th, 2018 featuring both Canadian NHL Centermen for the first time as a Penguin and a Leaf. These Frameworth Exclusive athletes sit at the top of their class, as they were both drafted first overall during their respective time. In the past, Crosby and Tavares have been teammates, representing Canada at the 2014 Sochi Olympic Games bringing home the gold. Both Crosby and Tavares have played in the IIHF World Junior Championships during their respective years collecting gold medals for Canada. Frameworth prides itself on using top quality materials to create durable, long lasting, and easy to hang collectibles. A Frameworth hologram and certificate of authenticity are included to ensure the legitimacy of both of the athletes' signatures. 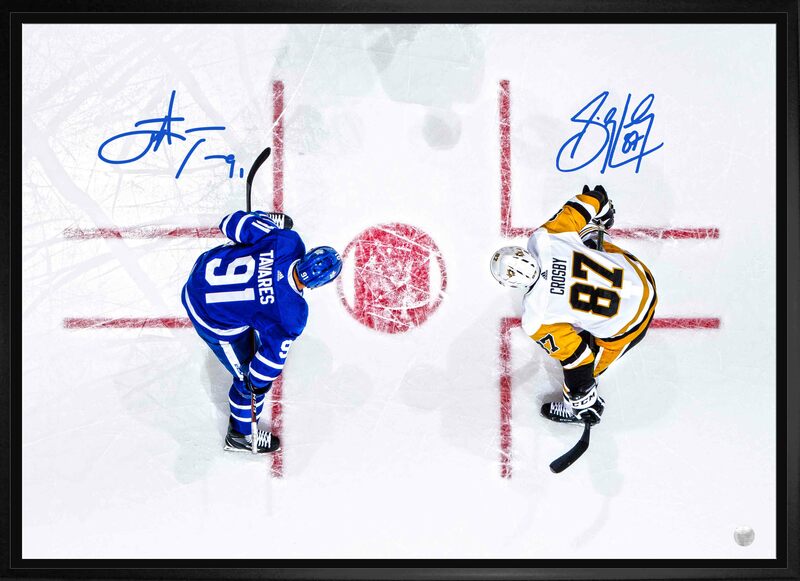 Frameworth is proud to be the exclusive autograph provider of both Sidney Crosby and John Tavares. FINISHED SIZE: 22x31"